It's hard to believe we have reached the midway point of the 2019 indoor track season. We have three meets in the books and three meets left on the schedule. 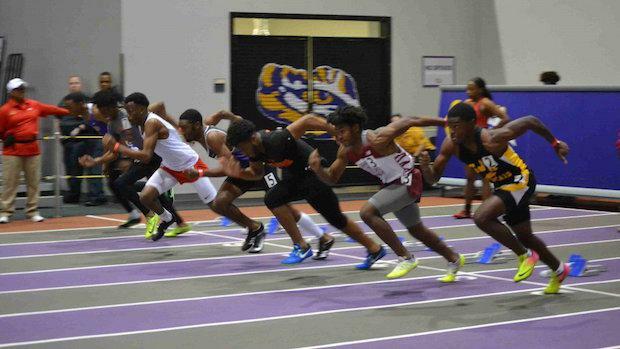 While the excitement is building over the next few weeks with the LHSAA Indoor Championship set for February 16th, let's take a look at what happened this past weekend at the LSU High School Qualifier. In the field events, we are starting to see the jumpers and throwers round into form. Most of these athletes set the mark to beat in the state this weekend. In the girls high jump, Alacia Myles (Edna Karr) cleared 5'-6" and Cameron Goodman (John Curtis) hit the daily double, winning the long and triple jumps with marks of 17'-9.25" and 35'-6" respectively. Logan Lewis (Baton Rouge High) won the shot put in 43'-6.75" and Heather Abadie (St Michael) won the pole vault with a jump of 11'-5.75", tying her for second in the state. On the boys side, Xavier Goodly (Westlake) captured the long jump in 21'-9" while Donald Jones (Broadmoor) won the triple in 44'-6.75". Chris Hilton (Zachary) destroyed the competition in the high jump with a leap of 6'-10". Johntrell Steward (Breaux Bridge) bested Zechariah Blake (John Curtis) to win the shot put with a throw of 54'-3.75". Brock Meyer (Westlake) cruised to a win in the pole vault with a jump of 15'00". In the sprints, we still see the relay teams shuffling lineups before state, so we won't know until the dust settles on everyone's linup. In the girls 60m dash, Kiana Foster (Loranger) won with a time of 7.59 and Kennedy London (West Feliciana) won the 60m hurdles in 8.98 seconds. Ta'la Spates (Brusly) took the 400m with 57.35. On the boys side, Corey Wren (John Curtis) outdueled Kam Jackson (West Feliciana) to win the 60m dash with a time of 6.87 seconds to Jackson's 6.93 seconds. Kai Hensley (Woodlawn BR) won the 60m hurdles in 8.39 seconds and Clydeterrious Thompson (Bogalusa) won the 400m with a time of 51.39 seconds. In the distance races, we are starting to see the cream rise to the top. The one relay team I will mention is the consistency of the Catholic High 4x800m team. They won Saturday with an incredible anchor leg by Collin Hedges. Their time of 8:22.48 could be a tough mark to beat. For the girls distance races, the 800m was won by none other than Mary Nusloch (Sacred Heart). She cruised to a 2:23.41 and made it look easy. The 1600m crown goes to Adele Broussard (Episcopal) with a time of 5:23.08, who also finished second in the 800m with a 2:26.51. The 3200m was all Lauren Hendry (St Joseph's). The LSU commit took control early and glided to a 11:39.07 win. For the boys, the 800m goes to Collin Hedges (Catholic High). He won with a time of 2:00.74 over Taejon Morris (Airline) 2:02.28. Colorado commit Hunter Appleton did what he does best, winning the 1600m by 1.5 seconds over Marshall Buhler with a time of 4:27.01 to Buhler's 4:28.54. Buhler got his redemption though winning the 3200m with a time of 9:45.24. When we last interviewed Buhler, he was still weighing his choices of colleges, with Louisiana Tech and ULL being high on the list. We will see what the next couple of meets hold. This Saturday will be the last McNeese meet and February 2nd will be the LAST CHANCE for athletes to qualify at LSU. Athletes will see where they fall in their division and hopefully get to the big show. In our preview for the Indoor Championship, we will break down athletes according to their division: small school (C,B,1A,2A,3A) and large school (4A,5A). Good luck to all the athletes!